On the fourth of May  the regular annual festival of the Turnverein Association of San Francisco took place, with all the usual accompaniments of music, dancing, gymnastics, oratory, eating and drinking. 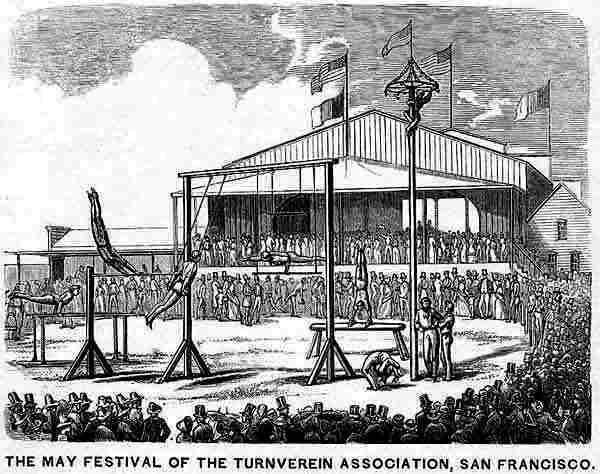 The festival, which was inaugurated by a procession of the Society to welcome their brother Turners from the interior, lasted three days, and everybody passed off in the most orderly and agreeable manner. The gymnastic performances were excellent, and formed a large portion of the ceremonies. The celebration of the "May festival," although in the United States it is conducted under the control of the Turnverein Association, is a national festival in which all the Germans partake, and which is celebrated throughout all Germany. The origin of the Turner Association, which has now become so large and so important a one among our German citizens, was a political one. Germany is divided into thirty-six different States, with as many Governments of a despotic nature, and many of them hostile to each other. Young Germany, deeply imbued with the spirit of freedom, has been for a long time anxious to throw off these yokes, and unite under one liberal, consolidated Government; but the rulers, in order to prevent this, have forbidden all assemblies or associations for political purposes, under heavy penalties. In order to avoid this prohibition an enthusiastic republican named Jahn made the meeting and associations for gymnastic exercises the occasion for the spread of democratic doctrines, and the Turnverein (or gymnastic association,) soon spread and grew into importance wherever Germans are found. This association now exists in, and exercises a great influence over the whole German population. There is no secrecy about the association, neither is there any direct connection between the different associations, although a Turner of any one city considers himself, to all intents and purposes, a member of the Turnverein of any other city. Letter sheet published by W.W. Kurtz & Co., Wide Wide West Office, No. 162 Washington Street, San Francisco. Return to the top of the page.